Forres Mechanics midfielder Alan Pollock (right). But the Forres Mechanics midfielder is determined to finish the job this weekend when the sides meet again in their Scottish Cup replay. Former Nairn County and Clach man Pollock rifled in his first with a left-footed strike from 30 yards that went in off the post before bagging another in the second half with an acrobatic volley from Logan Johnstone’s deflected cross. The Can-Cans passed up the chance to secure a second-round spot with David Churchill equalising for the Lowland League side late on, forcing the sides to do it all again in Edinburgh this weekend. Pollock said: “I’ve scored a few worldies in my time but they’re certainly right up there. I was under a bit of pressure for the first one but I switched the ball to my left foot, caught it sweetly and the goalkeeper had no chance. I don’t think the angle on the Scottish Cup cameras did it justice. “The second just sat up right and I caught it well. It was from a bit closer in but it was still a good finish. We chucked the game away, though – we went looking for the third goal and shot ourselves in the foot. 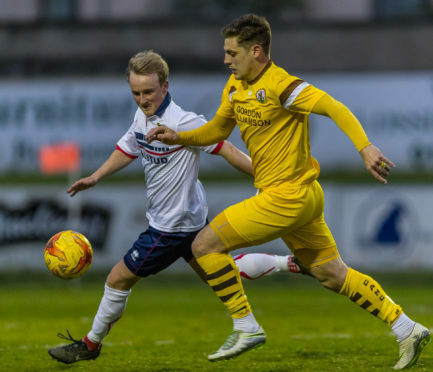 Pollock has been to the third round of the competition on two occasions, losing out to Arbroath with Nairn four years ago and going down 2-1 to Ayr at Somerset Park with Clach in 2012. Edinburgh City lie in store for the victors in the second round.